This unforgettable documentary feature film stands in stark contrast to renowned ethnographic filmmaker David MacDougall’s previous films exploring institutions for children in India. In his Doon School Quintet, MacDougall examined India’s most prestigious boys’ boarding school. His next project, SchoolScapes, was about Rishi Valley School, a progressive co-educational boarding school in South India founded on the educational philosophy of the 20th-century Indian philosopher, Krishnamurti. Gandhi´s Children chronicles the life of children in what the filmmaker calls “the exact opposite of Doon,” a shelter for orphans and juvenile detainees run by an Indian non-governmental organization. The Prayas Children’s Home for Boys is located on the northern fringe of New Delhi in Jahangirpuri, a resettlement colony whose residents were moved from inner-city slums several decades ago. It is still one of the poorest quarters of the city. The home was built in 1993, but its facilities are already deteriorating. There is broken plumbing, defective lighting, and other problems. The boys live in dormitories ranged around two central courtyards. 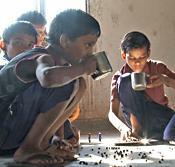 The home provides food and shelter for 350 boys. Some are orphans, some have been abandoned, others have run away from home. About half were picked up from the streets for minor crimes and are held under a court order. Living in the institution for several months, MacDougall explores its routines and the varied experiences of individual boys, including one who had been abducted from his family, one who was a seasoned street-dweller, another who was a pickpocket, and another who had been separated from his family during a fire in his slum area. Despite the harshness of their lives, many of the boys show remarkable strength of character, knowledge, and resilience. Often left to their own devices, they institute a seemingly arbitrary set of checks and balances to make sense of the chaos around them. Then one day 181 new boys arrive, having been “rescued” in police raids from sordid child-labor factories. The new children place additional strains on Prayas’s already deteriorating facilities. The institution does what it can, but is it enough? Gandhi´s Children is filled with scenes of great nuance and sensitivity and its extraordinary succession of revelatory moments exemplifies why David MacDougall’s work is unique among the world’s greatest ethnographic filmmakers. Destined to become another MacDougall classic, Gandhi’s Children will motivate thought, analysis, and discussion in a wide variety of courses in cultural anthropology, Asian and Indian studies, visual anthropology, education, and Third-World studies. It was produced by David MacDougall. It comes as a single dual-layered DVD.